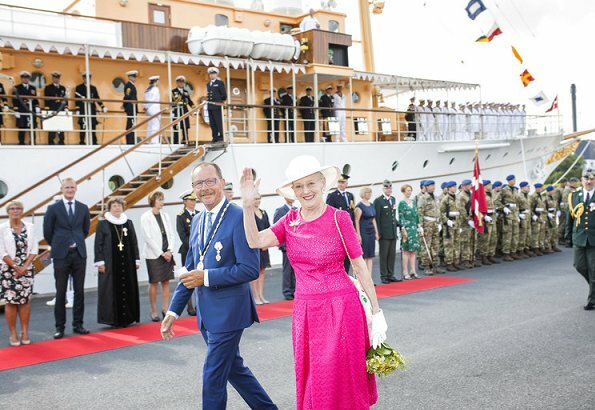 On July 19, 2018, Queen Margrethe II of Denmark arrived at Haderslev Harbour for her stay at Gråsten Palace. The Gråsten Palace in the south (Danish: Gråsten Slot) is best known for being the summer residence of the Danish Royal Family. 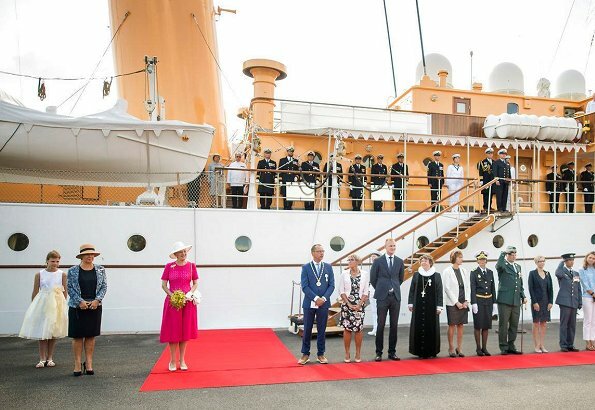 It is the usual venue for the royal family's official summer photo shoot. Terrific lady. She always makes me smile. Very flattering colour and shape of her dress. I love these bright colourful dresses she is wearing recently. A wonderful, admirable lady. Quelle fanfare! 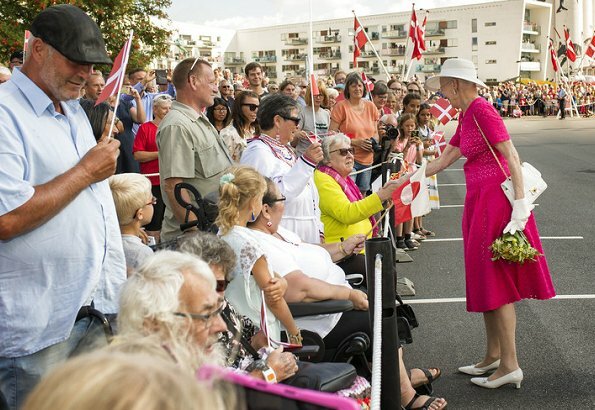 A part de Mary et Marie, on ne voit personne qui travaille a la cour du Danemark qui necessite des vacances. La reine a perdu son mari en février et elle a repris ses fonctions dans un mois. Ils disent que c'est des vacances, mais je pense qu'elle a besoin de temps pour pleurer. ( J'espère que je l'ai dit correctement! Le français n'est pas ma langue maternelle.) For all her fuscia dresses, IMHO I think she needs time to mourn. Votre francais est excellent. Oui, elle a besoin de vivre son deuil, mais prendre des vacances n'y changera rien. I'm just an old crabby person who finds all this very costly pomp unnecessary. 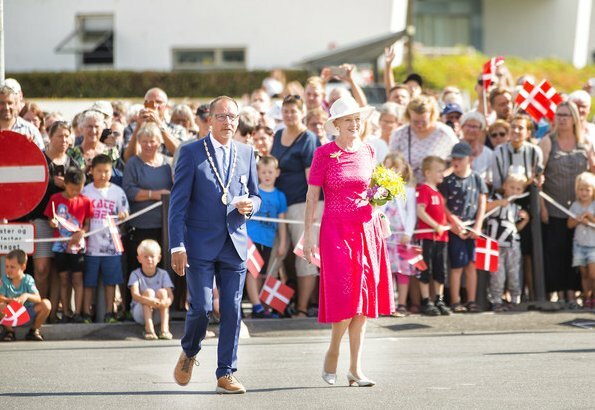 Q Margarethe looks fantastic the pink dress is fresh and summerly. 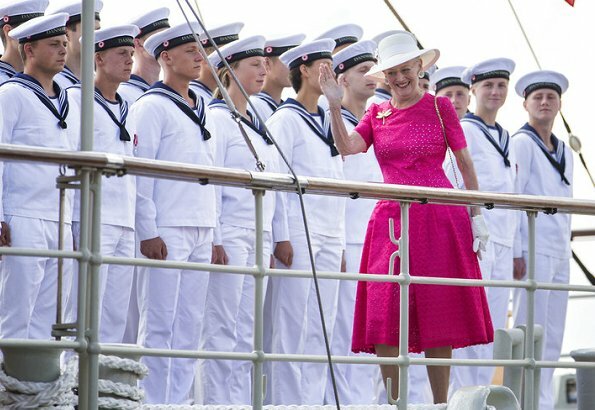 the Queen looks very good in strong colors, her smile is priceless. The other Lady looks good too. Mon Dieu! 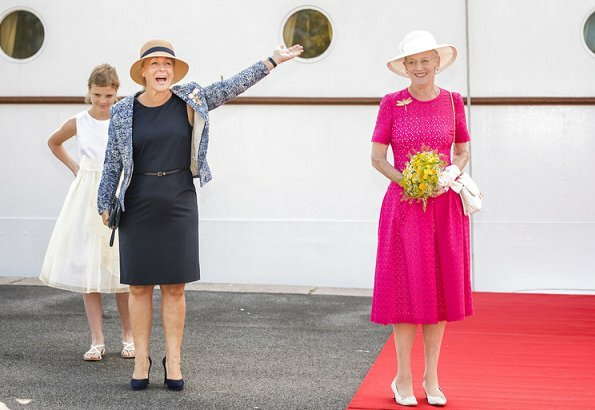 Il me semble que ça fait longtemps, très longtemps même, que je n'ai donné un 10/10 à la Reine pour sa tenue. Aujourd'hui, elle le mérite amplement et, la couleur lui va à ravir. We love our Queen,She always makes me smile with her big smile. She looks fantastic in pink. This style suits her and that brooch looks interesting. 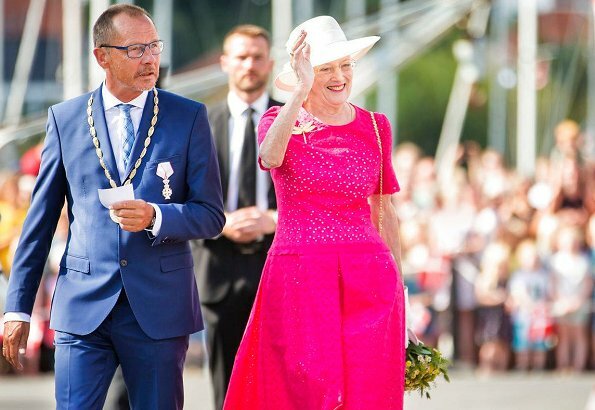 Queen Margrethe looks fabulous. May she has a wonderful summer holiday.